November 18, 2015 – Honeybee Robotics is beginning a new phase of development of its Planetary Deep Drill, a lightweight and portable drill designed to eventually reach kilometers below the surface of icy formations in the Martian polar caps, Enceladus, or Europa. By exploring these environments, scientists can hunt for potential signs of life in extreme environments while gaining insight into planetary formation. 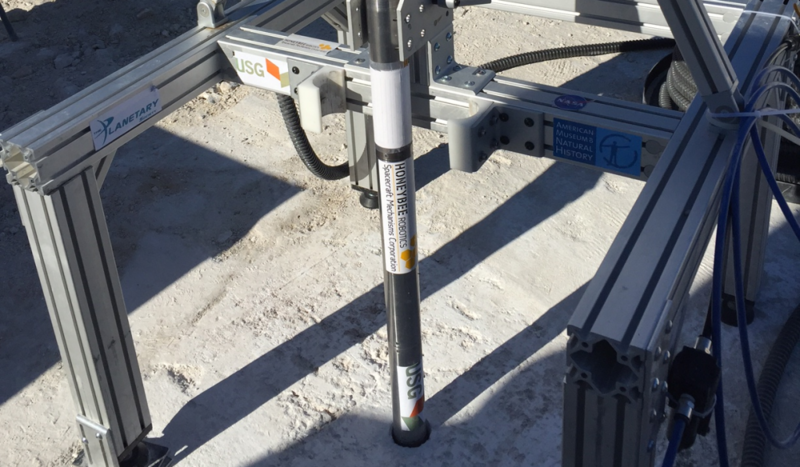 After validating the drill’s performance in laboratory tests, the company is now undertaking field trials at a gypsum quarry, where rock formations provide conditions analogous to drilling through future planetary targets. At USG Corporation’s gypsum quarry near the Salton Sea, California, Honeybee will select a formation of rock with strength similar to cryogenic ice. Engineers are targeting drilling to a depth of 100 feet, which will test the major functions of the drill and provide data for future improvements, including embedding additional sensors for “sensing-while-drilling” and in-situ experiments. “This prototype drill is exciting and highly innovative, not only because of the depths it can reach, but because it will carry a scientific payload that will deliver large amounts of data to the surface. A microscope with two LEDs will provide images with resolution high enough to image bacteria, and large enough to see fossils and/or geologic features easily visible to the naked eye. In addition, humidity and temperature sensors will be onboard the drill. These instruments are meant to demonstrate that rugged data-gathering instrumentation can be placed on board a drill that can penetrate deep enough to reach water, and perhaps life, on Mars,” said Michael Shara, science Principal Investigator of the Planetary Deep Drill, curator of Astrophysics at the American Museum of Natural History, and Adjunct Professor of Astronomy at Columbia University. Developed with the support of the Planetary Society and the American Museum of Natural History, the Planetary Deep Drill is intended to support planetary science and astrobiology research both by gathering samples for surface analysis and by embedding a suite of instruments in the drill itself for in-situ experiments. During the USG field trials, the drill will be equipped with humidity and temperature sensors, as well as a microscope capable of imaging particles as small as 0.5 microns in both white and ultraviolet light. Future iterations of the drill may embed instruments selected for the Mars2020 mission to test their performance in Mars-analog conditions. Compared to the capabilities of the Planetary Deep Drill, the tools that have already been deployed to the Moon and Mars offer relatively shallow access. The Planetary Deep Drill System is a wire-line drill, with its depth limited by the length of a tether suspending it rather than the length of an individual drill bit. The four-meter Planetary Deep Drill contains all of the motors, electronics and sensors required for operations. It uses a highly efficient rotary percussive drilling technology, which helps to conserve valuable energy, and can operate on as little as 250 Watts of power – less than many consumer-grade battery-powered drills. The configuration of the drill makes it possible to deploy from either a rover or lander before beginning autonomous operations. Honeybee Robotics has over two decades of experience developing a range of planetary sampling and processing systems, and has contributed systems to the Mars Exploration Rovers, Phoenix Mars Lander, and Mars Science Laboratory. Elements of the Planetary Deep Drill design are based on Honeybee’s Auto Gopher wire-line drill, which gathered core samples from a depth of 3 meters during a 2012 field test.